Wow! "Riley's Pond" won Honorable Mention in the Sunshine State Romance Authors "Show Me Your Cover" contest. This one I have to step aside and bow to my awesome cover designer, Kelli Ann Morgan of Inspire Creative Services, who managed to capture the essence of my story in a picture. I hate pictures of myself, especially on a Saturday morning without make-up or serious Spanx reinforcement! 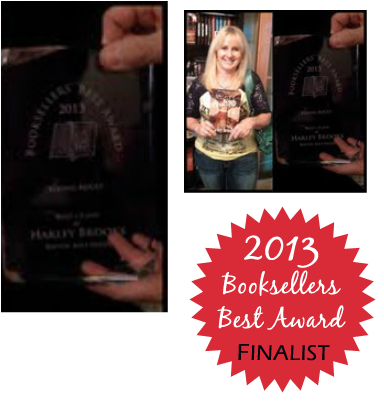 But I had to show you the gorgeous award "Riley's Pond" won in the Young Adult Category from the Greater Detroit RWA 2013 Booksellers Best Award Contest! Winning this category was huge. My final judges weren't agents and authors, but READERS and LIBRARIANS. I was up against some heavy hitters and blown away to find out I won. Truly humbled and honored.